Before he resigned, former EPA Administrator Scott Pruitt proposed a plan that would grant the EPA chief — whoever that may be — the power to censor crucial scientific research at the EPA. If this dangerous proposal moves forward, the head of the EPA will be the sole decider of what research is and isn’t considered when the EPA is supposed to set lifesaving health standards. This blatant power grab would wreak havoc on the EPA’s mission to protect the environment and human health, and jeopardize the substantial progress our nation has achieved over the last 50 years in cleaning up our air, water, and land. We must stop this outrageous science-censoring plan. Please help by submitting a public comment to the EPA opposing the agency's anti-science scheme today! The EPA is considering a proposal that would grant the EPA chief -- now Acting EPA Administrator Andrew Wheeler -- the power to censor lifesaving scientific research at the EPA. This blatant power grab would wreak havoc on the EPA’s mission to protect the environment and our families’ health, and tip the scales in favor of big polluters. 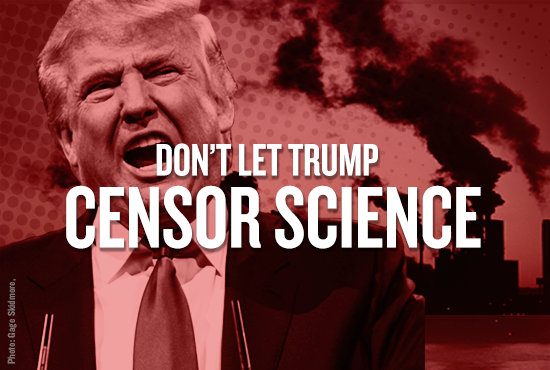 Help us stop this outrageous science-scensoring plan by submitting a public comment to the EPA opposing the agency's anti-science scheme today! Dear EPA Officials: I urge you to reject your agency's proposal that would grant the head of the EPA the sole authority to determine which scientific findings will be considered -- and which will not -- when setting new environment and health standards at the EPA. The EPA has a responsibility to fairly and objectively analyze all available research while devising rules and regulations. The health standards created and enforced by the EPA undoubtedly save lives. We cannot allow any one person at the EPA to censor science under the guise of "transparency," especially when we know that many of the agency’s leaders have no concern for the environment or our families' health -- and instead wants to tip the scales in favor of big polluters and away from objective science. To give the EPA chief the power to unilaterally dismantle lifesaving environmental safeguards -- or censor crucial research that informs those safeguards -- is dangerous. This unprecedented power grab will not be condoned by the American people. I urge you to put an end to the EPA's disastrous anti-science scheme.